OYong K, et al. MMWR Morb Mortal Wkly Rep. 2018;doi:10.15585/mmwr.mm6748a4. A 2017 outbreak of epidemic keratoconjunctivitis at an eye care clinic in Los Angeles was caused by a novel human adenovirus type, according to study findings. The outbreak highlighted a need for consistent infection prevention practices at eye care settings, researchers said. According to Kelsey OYong, MPH, supervising epidemiologist and health care-associated infections coordinator for the Acute Communicable Disease Control Program at the Los Angeles County Department of Public Health, and colleagues, infection prevention practices are urgently needed in the eye care setting. Although the strain associated with the outbreak, adenovirus type D53, has been found in Japan and Germany, it had not previously been reported in the United States. “Based on this investigation, it is believed that the virus was introduced to surfaces in the exam room by a symptomatic patient, and that subsequent lapses in infection prevention practices led to transmission to other patients,” OYong and colleagues wrote. According to their report in MMWR, the Los Angeles County Department of Public Health received a report about a cluster of seven patients with keratoconjunctivitis (EKC) on June 22, 2017, leading to an investigation. 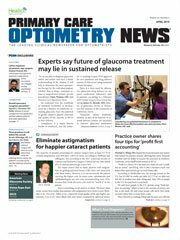 All patients had been seen at an optometry clinic with three exam rooms that sees an average of 1,300 patients a month, OYong and colleagues reported. An EKC case was defined either by a diagnosis from an ophthalmologist or optometrist of EKC, adenoviral conjunctivitis or viral conjunctivitis, or a laboratory confirmation of human adenovirus from a conjunctival swab specimen collected at the optometry clinic between June 5 and July 3, 2017. Any person who visited the optometry clinic between June 5 and July 3, 2017, and experienced symptom onset within 21 days of the visit were categorized as a health care-linked case. Household cases were those that occurred within a household or in a family contact of a patient with EKC. According to the study, there were 17 EKC cases — all symptomatic — including 15 in patients who had visited the eye care clinic. The two other patients reported having a symptomatic spouse before the onset of their own illness. Although there were no hospitalizations as a result of infection, seven patients visited a clinic, hospital ED or urgent care center for symptoms such as eye redness and discharge. Oyong and colleagues identified two clusters of patients. Symptom onset in the initial cluster began between June 12 and 25. After a patient from the first cluster returned to the clinic with EKC symptoms, more patients experienced symptom onset between June 26 and July 3. The investigation revealed a common exposure among 14 of the health care-linked patients, with all of them receiving examinations by the same optometrist in the same exam room. According to the study, other exposure areas included slit lamp contact, tonometry and dilating eye drops from a multidose container. The clinic closed for 1 day to perform intensive environmental cleaning and provide infection prevention training for the staff, according to OYong and colleagues. The next day, the city health department inspected the premises, observed infection prevention practices, interviewed staff members and reviewed infection prevention policies. OYong said patients were likely exposed to the virus through contaminated optical equipment or eyedropper tips. Disclosures: OYong reports no relevant financial disclosures. Please see the study for all other authors’ relevant financial disclosures.